Sheltered south or south-west facing wall or fence, or under glass in cool climates. Elsewhere nectarines need full sun to limit disease and produce high quality fruit. Topdress generously with well-rotted organic matter in spring , along with a balanced organic fertilizer. Keep the area under nectarines mulched with wood chips or sawdust. Garlic, Tansy, Dill, Chives, Cilantro and Nasturtium. Corridors within the orchard that are planted with clovers and other legumes contribute to soil fertility and attract pollinators. Pick when the color has fully developed and the flesh feels soft near the stalk. The fruit should pull away easily from the tree. Keep plant dry under cover to avoid peach leaf curl. 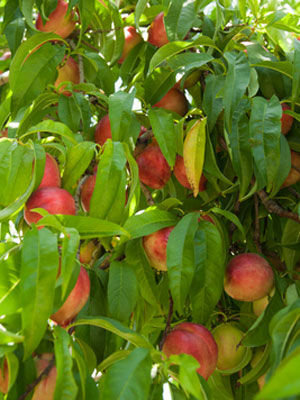 In humid climates, nectarines often develop problems with fungal diseases such as brown rot. Preventive sprays with organic fungicides are often needed to grow good quality nectarines. Plum curculios feed on buds, flowers and unripe fruits. Control by allowing hens to feed around trees, or shake branches to dislodge the insects onto a sheet then plunge into very hot water. Remove any fallen fruits as soon as possible. Peach borers can be identified by holes in the bark with a sawdustlike frass. Poke a needle into the hole to kill the borer.